Comfortable and friendly, The Yarn Patch features a wide selection of yarn, from luxury fiber to value brands. We also have books, patterns, needles, notions and accessories, as well as equipment. Our knowledgeable staff is available to help you achieve your goals. We are especially proud to carry many Tennessee hand-dyed yarns and regionally-sourced roving. Heather McLellan is the new owner of The Yarn Patch. She acquired the store in March of 2019 from Sheri Pitroski who began the business in April 2006. For Sheri, this was her third yarn store. She had previously owned stores in Wisconsin and Florida, but this one was the most special with a great group of customers who have become life-long friends. 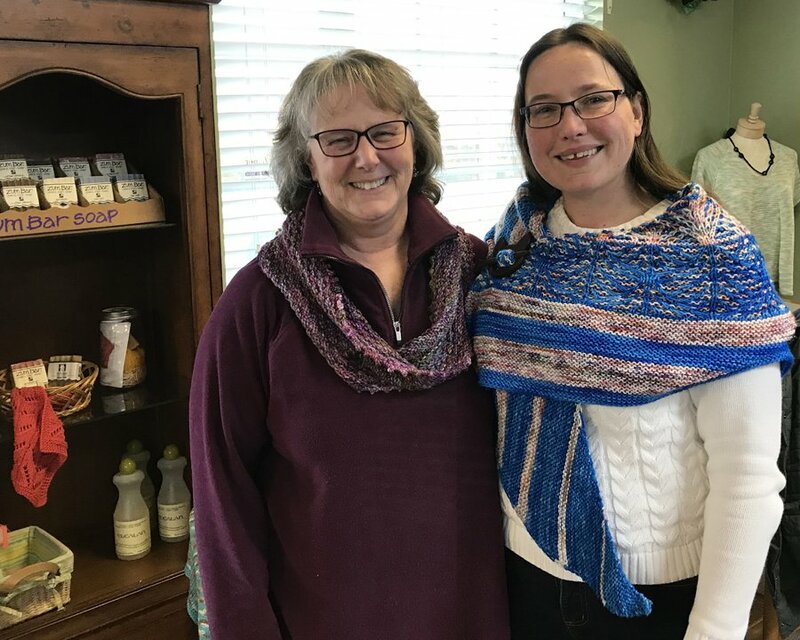 Ostensibly "retired," Sheri continues to teach at The Yarn Patch but she has entrusted the day to day operations to a new generation of fiber fanatic. That fanatic, Heather joined the Knoxville Knit & Crochet Meet-up group as a way to meet new friends. Well, within a few weeks she had a best friend and they were leading the group together. Heather became an even more accomplished knitter and crochet-er, as well as learning to spin and weave. After visiting yarn stores from Canada to Spain, the idea of owning a yarn store of her own had firmly taken hold. A Certified Public Accountant by profession, Heather had lots of exposure to retail while growing up, helping out in Aunt Lee Ann's retail stores and spending summers with her grandparents who owned The Log Cabin, a gift store that was once located just a few steps from The Yarn Patch! Heather's goal is to build on the great retail legacy of The Yarn Patch, but hopefully adding a few touches of her own. One is a commitment to add more fiber and class offerings for spinners and weavers. Another is adding a great selection of hand-dyed yarns from artisans here in Tennessee. Directions from I-40: Take Exit 322 and turn North onto Peavine Road. Travel 1.25 miles. The Yarn Patch is on the left. We appreciate our long distance customers! Call us at (931) 707-1255 to speak to a Yarn Patch employee. We would love to discuss your project, help you select the perfect items, and complete your order over the phone. Your payment and shipping information will be handled with care, and your order will be processed with a personal touch! Customers of The Yarn Patch may be confident that any products they purchase are high quality, direct from the manufacturer, and have not been exposed to any odors, pet dander, allergens, or smoke. To maintain this quality, while treating all customers equally and fairly, please understand that we cannot accept returns or exchanges. For online or telephone orders, if your order is incorrect or defective, we sincerely apologize for the inconvenience. Please call or email us within 30 days of purchase and we will make it right.